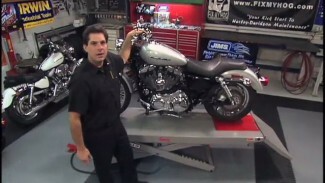 In this video, Bob takes us through inspection and service of front calipers on the Harley Ultra Limited 103. 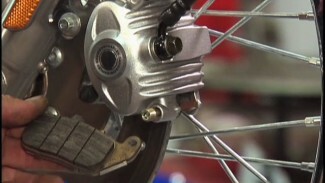 Correct front brake system operation is critical for correct and safe motorcycle operation. Begin your inspection by removing the mesh screen from the top of the Brembo Harley calipers. If you are unable to remove this cover by hand, Bob recommends the use of a plastic, or nylon, non marring tool. Note the orientation of this cover, as it can only be correctly re-installed in one direction. With the mesh screen removed, you can inspect your brake pads and blow out your caliper assembly with compressed air. If you are removing, or replacing brake pads; remove the small retaining clip with a needle nose pliers and loosen the brake pad pin with a 5mm allen. Now, you can loosen and remove the Brembo Harley calipers mounting hardware using a 10mm 12 point socket. Be careful not to damage the ABS wire and note orientation of the ABS wire retainer. Carefully slide the caliper down and away from the brake rotor. With the caliper free and in your hands, you can now completely remove the brake pad pin. Remove one pad at a time by simply pushing the pad to the center of the caliper and, then, down. If your pads are below the service manuals minimum spec of .016, or pads are wearing unevenly; you will need to replace your pads as a complete set. Replace, both left and right on a dual disc assembly, like this Ultra. Before reinstalling your Brembo Harley calipers, you should inspect your brake rotors. Replace rotors if they are under .180 as specified in your service manual. Use a micrometer to measure for thickness. If a rotor is warped, it will need to be replaced regardless of thickness. Replace, both, left and right side rotors, together, as a set, for dual disc assemblies. Apply anti seize to the brake pad pin when reassembling. Hand tighten the pin. 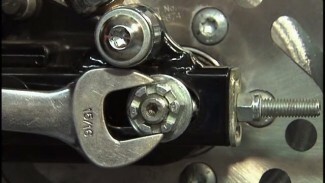 Use blue Loctite on caliper mounting hardware and tighten to correct factory torque specs. Now, you can also final tighten your brake pad pin and install the retaining clip and dust shield. Always remember to pump up your front brakes before going for a test ride. Your front and rear brake systems need to function flawlessly, all of the time. Always service and inspect these areas thoroughly and with care. Brake inspection should be a part of every pre-ride safety check.